Low-frequency, highly damped mounts for a high level of vibration isolation. 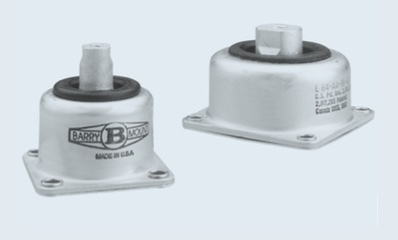 Barry L-Mounts increase equipment reliability and extend component-life by providing isolation for frequencies as low as 10 Hertz and exhibiting low transmissibility at resonance (below 2.5) with .60″ double amplitude vibratory input. Operating temperature ranges of -67°F to +250°F (-55°C to +120°C). Meets vibration and shock requirements of MIL-C-172C. L44 and L64 isolators are known as “MS” (Military Standard) mounts and appear on QPL’s.